The F-104 Starfighter had it's Ejection Seats Modified for the F-104A to the F-104B. La F-104 Starfighter tena su eyeccin de asientos modificados para el F-104A a la F-104B. During the service of the F-104B, the Lockheed C-1 downward-firing ejection seats were replaced with the C-2 upward-firing ejection seats. Since the ejection was originally downward, the cockpit canopy of the F-104B had not been designed to be blown off the plane during the ejection. The canopy had to be extensively redesigned so that this could be done. Among the changes was the addition of a stationary, fixed transparent central section separating the two individual jettisonable canopies to ensure clean canopy separation during ejection. In every case the old-style canopy, you will see the early downward-firing ejection seat without upward guide rails. In every case of the new canopy, you will see the structure for the upward ejection seat rails. Also, the middle section of the new style canopy had a clear separator that formed a windshield for the aft cockpit if the forward canopy section was lost in flight or damaged by a bird strike. 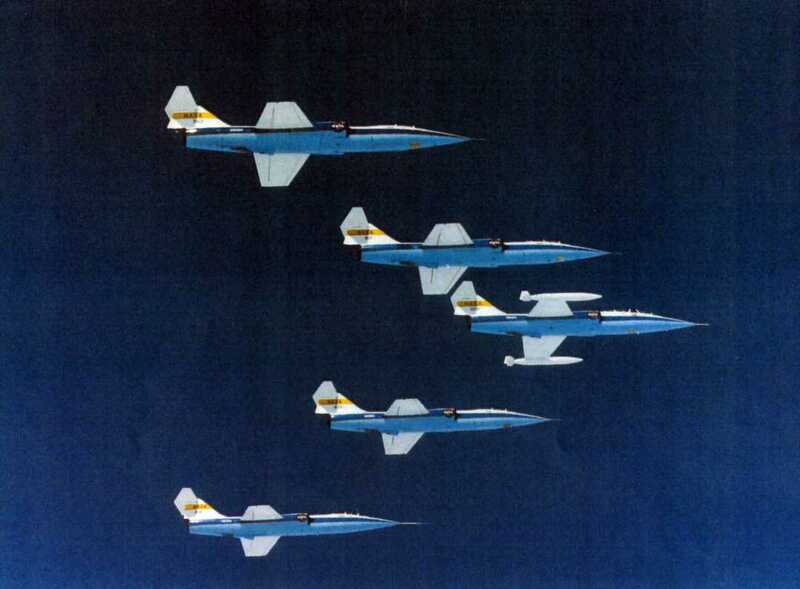 Along with the F-104A, ADC F-104Bs were transferred to the Air National Guard in 1960. ANG squadrons operating the F-104A/B were called up to active duty during the Berlin crisis of 1961 and deployed to Europe. When the ANG squadrons reverted to state control in 1962, their F-104A/Bs were retained by the USAF and turned back over to the ADC. The last F-104B left ADC service in 1969. In 1960, the Pakistan Air Force received two ex-USAF F-104Bs along with ten F-104As to equip one squadron. These aircraft took part in both the August 1965 and December 1971 wars with India. At least two F-104Bs were delivered to the Republic of China Air Force on Taiwan. In the spring of 1967, three F-104Bs were turned over to the Royal Jordanian Air Force along with two seat F-104As. At least two are on display in museums. F-104B 53-1303 was handed over to NASA as 819 in December of 1959. Others ended up in the boneyards at Davis-Monthan AFB. 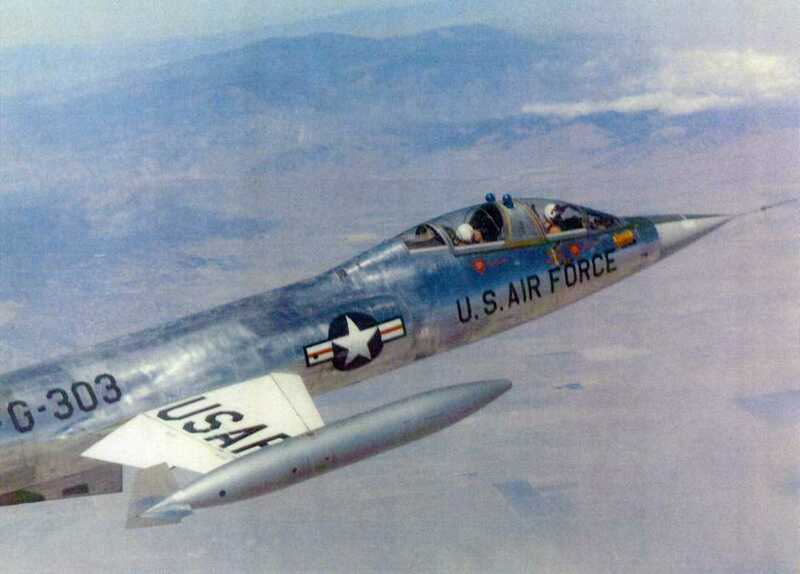 Click on the Right Arrow to go to the Next F-104 Starfighter Jet Aircraft Page. Read about the Prairie Aviation Museum in Bloomington Illinois. Take a ride into Space, In a real Space Plane.